This is a debut novel that is absolutely mesmerizing! The author of this magical story is a very-accomplished memoirist who has been heralded by the New York Times Book Review for his Editor’s Choice Pick, Turtle Feet. 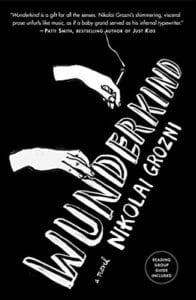 But in this, his first foray into the world of fiction, Nikolai Grozni offers a captivating story that will have readers calling out for his next book! The narrator of our novel is a fifteen-year-old young man by the name of Konstantin, and to say this boy has talent would be an understatement. In fact, Konstantin is brilliant - and he knows it - as he creates music as lovingly and artfully as Michelangelo did when sculpting his David. But Konstantin is experiencing many difficult issues in his life. He has been literally confined to the Music School, and is reacting substantially to the issues involving his country and his government. It is Sofia, Bulgaria in the late 1980’s and the communist regime is absolutely brutal. They’re also the ones who run the Sofia Music School for the Gifted where Konstantin lives. The school is run with the same “iron fist” that the rest of Sofia is run by; these people are unmerciful, unbending, and completely rigid to the children, causing some to end up despising the music that’d once made them happy. Konstantin is a rebel. Smoking, drinking, partying - he simply can not stand living under the brutality and oppressiveness that communism has caused in his life. Although the depression, despair, and fear exist in Konstantin’s heart and soul, his outward behavior is that of pure arrogance, which not only hurts him in school, but also makes it impossible for him to get close to the one person who he cares for deep inside his soul; Irina - a lovely girl whose violin is her only saving grace. The one thing that Konstantin can always count on is his piano. An extremely talented musician, the passion and drive he has for piano playing is the only thing that makes his world possible to live in, and also gives Konstantin the opportunity to get out of the country and out from under his own self-destructiveness in order to have a life and secure a blessed future. Each and every page of this book is remarkable. The author has done a superb job of structuring each chapter so that it relies upon a piece of music. In fact, it is so well done that it feels as if you’re reading not a novel - but a tribute to the world of music. This man’s life may have started out as a horror show but, through music, became a true and utter gift. Quill Says: A literary triumph! This in-depth and highly emotional look at life behind the Iron Curtain for a piano prodigy is beyond outstanding, and one readers will never forget!